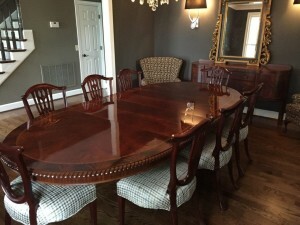 At Brendan Carpenter, we create unique, individual pieces of furniture and cabinetry using the finest materials and highest quality construction methods. We provide a full range of professional furniture refinishing, custom furniture and cabinet building and refinishing services. Contained in the galleries below are numerous examples of custom built-ins, desks, tables and cabinets that have been created by us for our clients. Additionally, our finishes are of the highest quality which is why many clients engage us to update and refinish their existing kitchen cabinets rather than replacing the cabinets. Whether you are looking to have a favorite family dinning room table refinished or want that special sized bookcase made, we can assist you. We’ll work with you through every phase of the process from conception and design, to finishing and installation. Contact Brendan Carpenter today and he will be happy to discuss your project. Find out why so many clients are happy they chose him. Custom walnut writing table with mahogany accents…. Custom made African Mahogany Hepplewhite sofa table…. Leather top desk fully restored and refinished…. Custom made sleigh bed on pedestal feet…..
Hand made toy chest created from 100 year old reclaimed doors…..